I have been crafting forever! Taught well by my late parents, drawing, sewing and knitting etc. 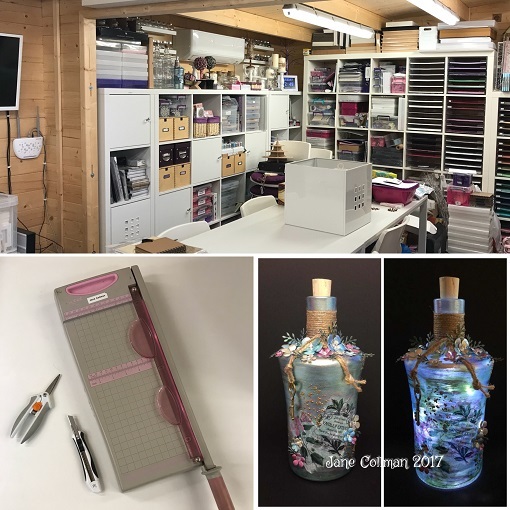 I started making cards over 20 years ago before my youngest daughter was born and then worked in various craft shops, teaching and demonstrating the wonderful array of products! I have also been lucky enough to have had projects in a number of magazines in the past. I live in Surrey, just a half an hour train ride south of London, and 10 minutes from the biggest car park in England….the wonderful M25!! We all hate it but use it frequently. I am lucky enough to have a big cabin in my garden which is my workroom, storeroom and classroom. It’s very much my Sanctuary and I can lose myself out there for hours! No children, dogs or husband…..just crafting. I hold workshops in there and I have everything including the kitchen sink! Photo shows half the cabin, bit of a mess at the moment…sorting out cupboards again! Help…I’ve run out of space! My favourite project ever has to be the glass bottle I painted for a class project. Couldn’t have done it without the aid of Stix2 extra sticky doublesided tapes and hot glue! Photo shows bottle with and without lights. What do I reach for most….hmmm, couldn’t be without my trusty scissors, knife and guillotine. I was thrilled to be asked to demo for Stix2 several years ago. This has enabled me to visit some amazing craft shops in the South East and meet more lovely crafters. I do enjoy being able to show the great and varied products Stix2 have. Thank you to the wonderful Michelle Johnson for introducing me to Ruth and her brilliant team at Stix2! 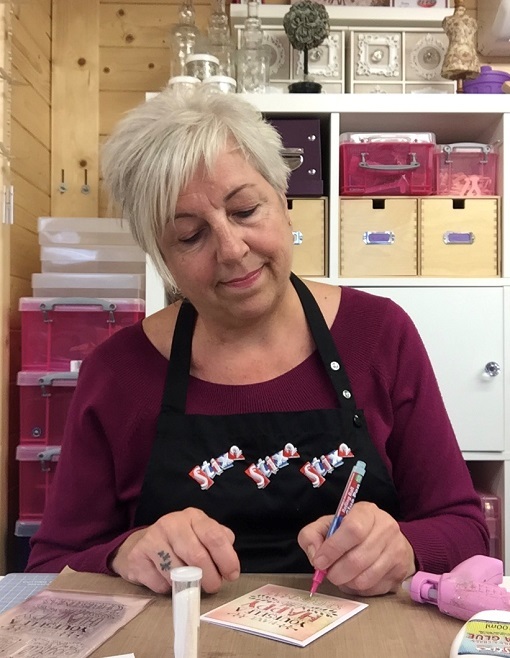 Visit www.stix2.co.uk to see when Jane is next demonstration. For further information contact us on the details below.